( Blog Updated At 6:10PM MST). First Snow In Carlsbad, NM Tonight. Special Briefing From NWS Albuquerque. Winter Storm Warnings Continue . For Chaves & Lincoln Co's. My Thoughts For This Storm Tonight. 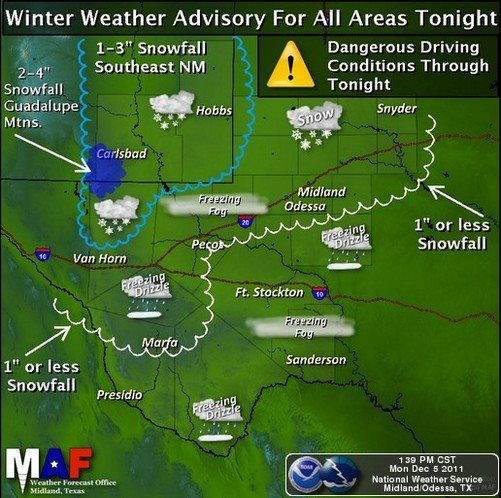 It appears that the worst of our weather is on its way this afternoon, into tonight, and tomorrow morning here in SE NM. Snow is picking up in intensity here in Carlsbad, as well as other nearby areas including southern New Mexico. A Winter Weather Advisory continues in effect for Eddy, and Culberson Counties through tomorrow morning. Lea County has now been added to the list. Another 1” - 3” of new snow will be possible this afternoon into tomorrow morning. 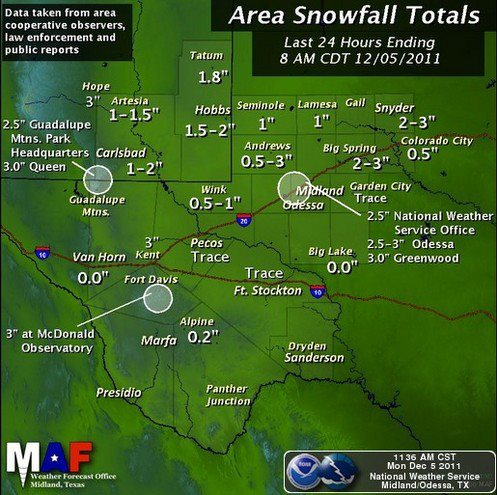 The Guadalupe Mtn’s could easily pick up another 2” - 4” of snowfall. Winter Storm Warnings continue for Chaves, Lincoln, and Otero Counties, into tomorrow morning for heavy snow, blowing snow, low visibilities, and extremely dangerous driving conditions. Our upper-level storm has dropped further to the south and west than forecast, and early this afternoon it was centered over southern Arizona. My concern is that this upper-level storm could stall or slow down in its eastward movement, and not lift out over the state as forecast. If this happens, then our chances for receiving heavier snowfall totals will go up tonight into tomorrow morning at least. This is a potent and dangerous winter storm, and National Weather Service Forecasters have been warning for several days now that this was going to be a serious storm for the state. Their forecasts are verifying today. The other bad news for us here in SE NM is the temperatures. Temperatures are falling at 1:40 PM MST. They range from 16 in Clovis with a wind chill of -3, to 21 in Tatum with a wind chill of 4, to 23 in Roswell with a wind chill of 8, to 27 in Artesia with a wind chill of 14, to 30 in Carlsbad with a wind chill of 22, to 27 in Hobbs with a wind chill of 17, and 25 in Guadalupe Pass. Its 14 in Cloudcroft and 12 in Ruidoso with a wind chill of -3. Temperatures will continue to fall this afternoon into tonight. We are forecast to drop down into the teens for most places tonight, maybe down to near 20 in a couple of spots. Snow will continue to fall throughout the area. Roads across the area will soon become a nightmare in those areas that have not frozen over yet such as Carlsbad. Tonight, our roads will become extremely dangerous, and perhaps impossible to navigate in some areas. I continue to update my web page as often as new information becomes available so please check back there often. 8 AM Snowfall Totals Across The Local Area. 1 Mile NW of Roswell 4.6"
4 Miles S of Roswell 4"
3 Miles NW of Roswell 4"
5 Miles S Bitter Lake Wildlife Ref 3"
4.1 Miles NNE of Roswell 2.5"
0.3 Mile SSW of Roswell 2.2"
Artesia - Public Report 4"
Queen 33.3 Miles WSW of Carlsbad 3.0"
Atoka - 4.8 Miles SSE of Artesia 3.0"
12 Miles WNW Carlsbad 3"
2.1 Miles NNW Downtown Carlsbad 2.7"
(1.5" on the ground at 4:00 AM Tue). NE Artesia - Public Report 3"
1.7 Miles SW of Tatum 1.8"
6 Miles WSW of Bonito Lake 11"
1 Mile S of Capitan 6"
6 Miles WSW of Bonito Lake 5.0"
4 Miles NNE of Ruidoso 4.5"
3 Miles NNW of Ruidoso 4"
3 Miles NE of Ruidoso 3.0"
1.4 Miles ESE of Lincoln 2.0"
0.3 Mile ESE of Cloudcroft 3.0"
2.3 Miles South of Cloudcroft 3.0"
0.07 Mile N of Sunspot 2.5"
1.8 Miles SW Cloudcroft 2.0"
0.6 Mile S of Pinon 1.5"
4.9 Miles NE of Cloudcroft 1.4"
0.8 Mile SE of High Roll .3"
8 Miles SSE of Portales 4"
1 Mile SW Fort Sumner 4.0"
1 Mile SSW Portales 3.5"
1 Mile ESE of Clovis 7.2"
Additional snowfall totals will be listed as they become available today.